The station has three floors which are reachable by escalator or elevator. Outside are two platforms that give access to three tracks where trains can stop. Since the platforms are very long, they can be divided into an A and a B platform, giving a total of six platforms. The sliding doors are a combination of a Power Functions M-motor, a chain and a clutch gear. The doors are opened by the microcontroller, based on a randomized open/closed time. The elevators work also with a Power Functions M-motor and a clutch gear. To stop at different floors, a timer is used to enable the motor to move the elevator to the wanted floor. Since small differences in friction cause the elevator to run "out of phase" (it doesn't stop exactly at the wanted floor, but a few mm above or below it) after a while, the system needs to be "reset" by sending the elevator to the 3rd floor (roof), where the spool is rolled entirely. After that the clutch gear kicks in. I could have made the system more intelligent by using sensors, but I've chosen not to to minimize the amount of visible cables. The escalators are powered by an old 9V motor which I had laying around. 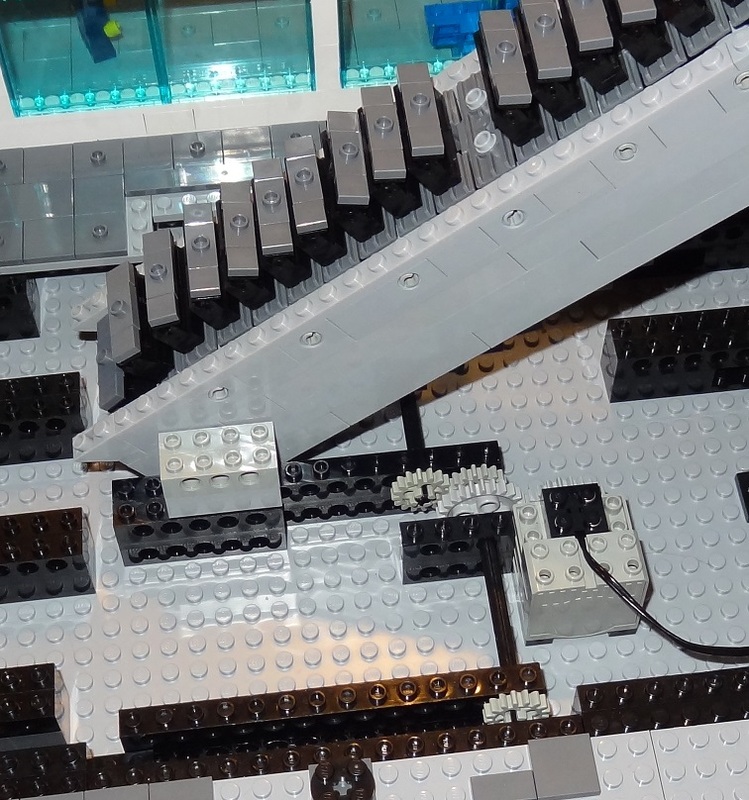 One set of escalators is powered by one motors. 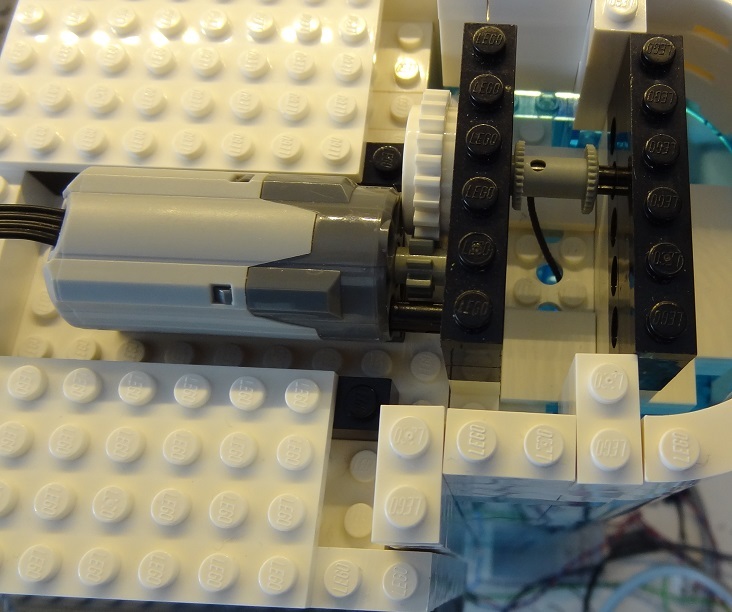 By using a combination of gears, the escalators turn in oposite direction. The axle of the escalator is connected with a chain to the axle of the gear combination. The base of the escalators is a chain made of modern technic links. In the technic links are two 1/2 technic pins on which a 1x4 plate is attached. On top of that plate are two hinges that make the step horizontal. On top of the hinges is a finishing layer with a jumper plate and tiles. Also the escalators are controlled by the Arduino controller. This is done since the escalators are heavy and need some extra power when started. Next to that I can make it stop after a few seconds when shooting a scene with minifigs on it. All ceilings in the main building and waiting areas outside have built-in lighting. 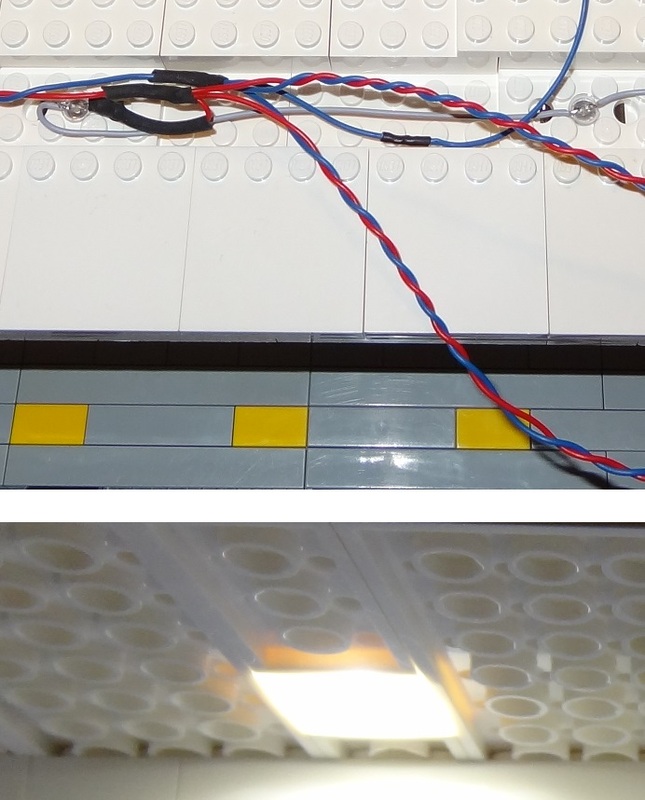 The built-in lighting is made by sticking a LED through a technic plate and attaching a transparant 2x2 plate.